This is a Lia Sophia or Silpada Knock Off. 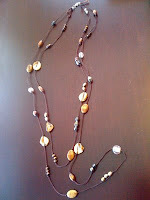 This is the project on which I learned that not all beads have the same size holes. Most of the beads would not thread through with the large cord. It took me weeks to find an effective bead reamer. I ended up finding a seriously fine tipped taper reamer at a local glass shop, Blue Moon Glass, which I put into my cordless drill and used with a sponge and a dish of water to ream each stone until it fit. Not something I care to repeat any time soon, but the results are great. People are shocked to find out I made this one myself. That's always the best compliment!